I just got back from the International Living conference in Las Vegas, and I am amped! There were so many exciting conversations and presentations there last weekend that I am still on a travel high right now. I want to go everywhere and see everything, but I guess for the moment I’ll just have to settle for continuing to relive my time in Ecuador. Listening to the many presentations about retiring to Ecuador revitalized my love for the country. Much like I did a while back in reliving my time in the Andes, now I’d like to revisit my travels away from the mountains. During my six months in the country, I tried to see as much as I could during my breaks from teaching English in Otavalo and taking classes in Quito. I absolutely adored the mountains and the many small towns and villages I found there, plus the bustling chaos that I grew to love in Quito. 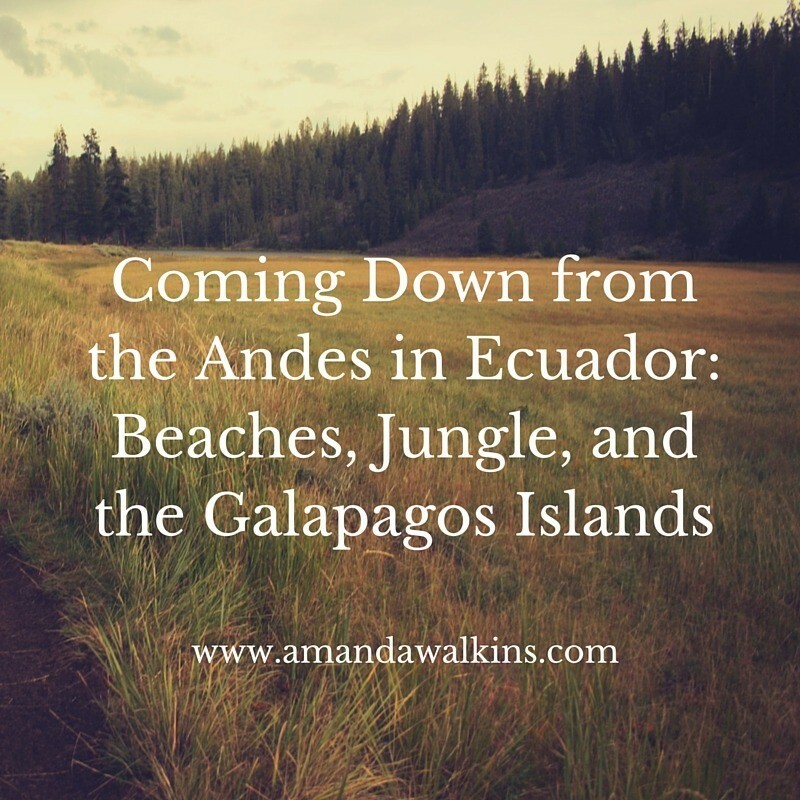 At the conference, I had many people ask me to compare my life in Ecuador with my life in Roatan, so it was fun to chat about all my favorite aspects of both locations. Ecuador is an amazingly diverse country in a small space, allowing you to see and do so much even during a brief vacation. Here are some of the highlights of my travels after coming down from the Andes in Ecuador. Beaches, jungles, and the epic Galapagos Islands – come join me! I spent almost two weeks traipsing along the Pacific coast of Ecuador, enjoying some beach vibes and fun activities. My favorite stop along the way was actually Crucita, which probably differs from most travelers’ affinity for Montanita. Montanita was fun and filled with the hippie vibe – you’ll see lots of young backpackers and surfers around town and the parties continue into the morning hours. Personally, I was seeking more tranquility. So I continued heading north with a stop in Puerto Lopez, which offered great little local artisan shops and a more peaceful vibe, though I only stayed for one night. I did enjoy checking out the multitude of small fishing boats lining the shore at sunset, and the bay offers a lovely beach to mosey along for gorgeous sunset views. When I made my way even further north to Crucita, that’s where I found my peace. I found an adorable spot to stay – courtesy of a personal recommendation from a friend in Quito – and I was in love. I had the entire beach to myself, which allowed me to siesta, leave my belongings up on the sand while I frolicked in the water, and I had ample time to enjoy pristine nature. While in Crucita, I also jumped off a cliff. Of course, I had a parachute, but still. Paragliding was such an amazing experience and I can’t recommend it highly enough! Crucita is well-known for paragliding and hang-gliding, while Montanita and Canoa are better known for surfing. I had intentions of taking surfing lessons while in Montanita, but spent only about 30 minutes on the beach my first day there and burned so badly I had to hide away from the sun for the next few days. Lessons learned: Equatorial sunshine is no joke and applying sunscreen to your own back is never a good idea! From Crucita I reluctantly continued my journey to Canoa, another popular beach town filled with backpackers and expats, but with a more relaxed vibe than I had encountered in Montanita. I really enjoyed Canoa, but after falling in love with Crucita, nothing else could compare. Canoa was my final stop before heading back up into the altitude of my mountain abode to marvel at the way the light hit the mountains and the clouds rested below my balcony. After an incredibly bumpy and eventful bus ride from Quito headed northeast, I managed to stumble out into the middle of the Amazon Jungle in the Cuyabeno National Park. Cuyabeno Jungle Lodge was my destination, perched along the Cuyabeno River in the northeastern section of Amazon Rainforest claimed by Ecuador. Interestingly enough, I headed there around the same time that the Colombian military bombed a FARC camp in Ecuadorian territory, which set off protests and talks of war in Quito. Have no fear, war did not break out and the jungle continued to provide refuge for animals and humans alike. Do not be mistaken: a trip to the jungle is not glamorous. There are insects, wild animals, and limited to zero infrastructure. Staying at Cuyabeno River Lodge was one of the most amazing experiences of my life. I learned the valuable lesson of a headlamp as I attempted to evict a swarm of cockroaches from my bag one night – two hands are better than one and shining a light the same direction your eyes are facing does wonders to actually allow you to see. I learned that hormigas de limon are quite tasty (I’ll let you Google Translate that). I learned that piranha is also tasty, but ayahuasca is vile. I learned that proper rain boots are the only footwear acceptable for jungle traipsing and that ponchos are seriously underrated. I learned that sitting in a canoe for 4 hours straight is uncomfortable, but can bring you to intriguing and amazing places and people. I learned that the Amazon I read about as a child is even more mesmerizing and mind-boggling as an adult. Finally, I learned that a good camera is nice to have for wonderful photos, but taking in the moment is so much more important! So here’s a crappy photo from a canoe ride while howler monkeys eyed us inquisitively. My best friend from home flew to Quito to visit me for a few weeks, during which time we planned a once-in-a-lifetime adventure to the famous Galapagos Islands. At this point in my life as a scuba diver, it makes me so sad that I didn’t dive while I was there. But, have no fear, I did plenty of snorkeling and frolicking with sea lions and penguins. Given our tight student budgets, we opted for the cheapest option I could find for an 8-day liveaboard to visit as many of the Galapagos Islands as possible. Our little boat, Yolita, took us island hopping to discover the amazing diversity in this stunning area. Our little Yolita on the left, next to the next smallest boat in the area. Close quarters made for quick friendships on board! Blue-footed boobies doing their mating dances entertained us for hours while sea lions continuously wanted to play with us in the water and on land. Iguanas crawled and climbed all over each other and munched on tiny little leaves without pause as we walked only inches from them. Elegant albatross surprised us with beak battles over territory before flying away in almost cartoonish take-offs over the cliffs. Each morning we awoke to a new island boasting different colored sand and unique biodiversity. We carefully, painstakingly rinsed all sand before embarking at the end of each day to try to avoid transferring it to a different location, thus destroying the very reason for this natural marvel. There are not enough words to describe the amazing experience that visiting the Galapagos Islands can offer. Yet, simultaneously, we kept discussing how guilty we felt even stepping foot on these formerly pristine islands. We kept thinking that each footprint changed everything. Traveling to the Galapagos Islands was an amazing experience, and, if nothing else, it made us hyper-aware of our tourism impact. It’s something to always be aware of wherever you go, but especially in a natural environment so pristine and thus far unharmed by human interference. Whether you’re visiting Ecuador or moving there, you have to explore as much of this beautiful country as possible. Take a look at my time in Quito and Otavalo, plus 7 other mountain towns I recommend you visit. All of my travels throughout Ecuador left me with such appreciation for this country. Memories bring me back for now, though I doubt it will be long before a plane brings me back for a Terra Firma visit once again. In the meantime, I’ll keep enjoying the plethora of stories and information International Living posts regularly. I hope you do, too!